How much venture capital did Pakistani startups raise in 2017? A good friend asked this question yesterday. 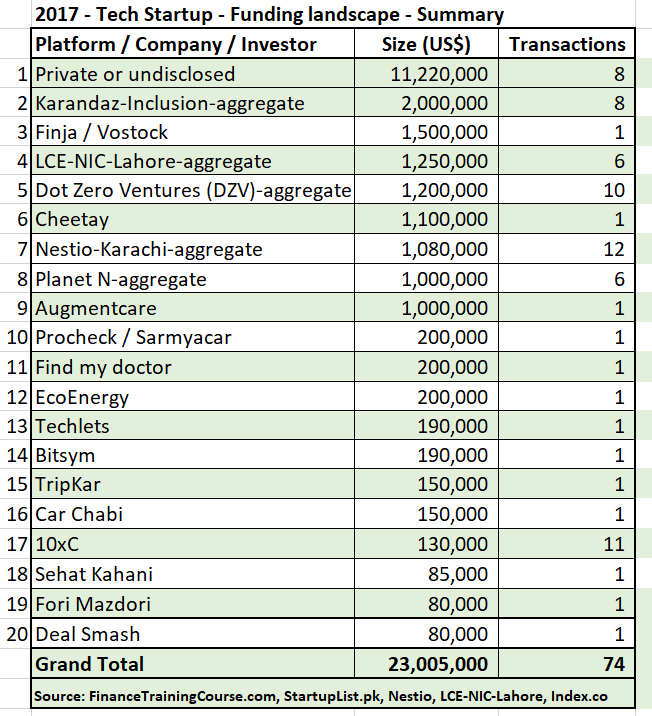 What was the size of the technology venture capital investing market in Pakistan in 2017. 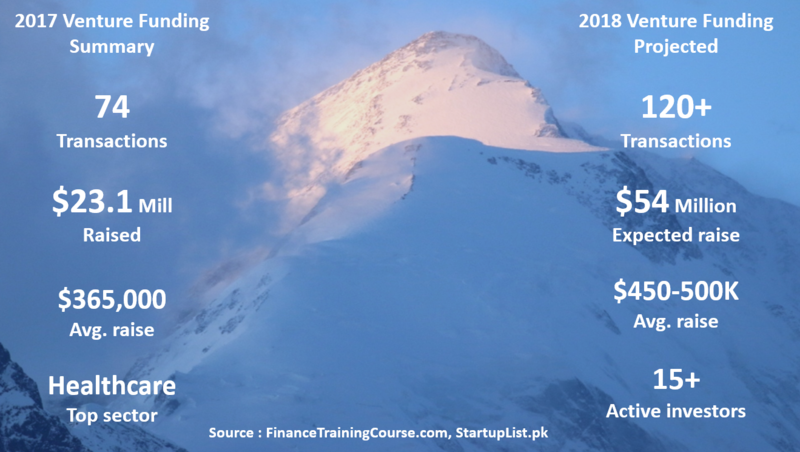 How much venture capital funding Pakistani startups raised in 2017? Especially from local (read:Pakistan origin) sources for local companies? Total funding (dollar amount) raised in 2017 and the total number of transactions? How did the numbers compare with previous years? What would this figure look like in 2018? TL;DR; Venture capital funding raised by Pakistani origin startups in 2017 was US$ 23.1 million across 74 transactions. Ignoring some local eccentricities the average raise was US$ 365,000. This number will change and move upwards as more data comes in and is reported. Thanks to my friends at StartupList.pk we have been able to informally track figures for 2013-14 and 2015-16. StartupList.pk created a template for startups to self report funding events that formed the basis of their data set. However there was no major recent public update done for 2017. Also a big thank you to Techjuice.pk and ProPakistani.pk for their work documenting press releases and funding events. In addition to Startuplist.pk, both publications made it possible to cross check figures and references. Techjuice also has a JV with TNW that allows funding events to show up on Index.co. All three resources were very useful when we began to compile and cross check our figures. If you run a startup and you have raised a round, please add your name to the StartupList database so that we can track updated figures every year. Tracking numbers in an accountable fashion with cite-able sources is good for everyone and gives a clear indication to interested parties that something really good is cooking on the stove here in Pakistan. We made a few phone calls/emails today to get a handle on the ball park figures. Some fund raising announcements were public or were at least aggregated on public platforms such as Finja’s recent 1.5 million dollar raise. Many others however were private. Some were kind enough to allow us to report their funding events on this platform while quite a few wished to remain private. The list here is just an initial attempt to get the conversation started. As we get more numbers and figures, we will be happy to update and consolidate the results. Help us add more clarity and visibility to the technology fundraising environment in the country. Share your data. As of this morning based on the six conversations we have had, the summary figures look quite promising for 2017. From the data reported to date for calendar year 2017, 74 transactions were closed raising a total of US$ 23.1 million in 2017 in funding for tech startups. This is not an all inclusive list. A number of fellow founders and investors were kind enough to share their information publicly and privately but we still haven’t received data from a handful of platforms. How much venture capital did Pakistani startups raise in calendar year 2017? Given the fact that we don’t have final figures as yet from Plan 9/Plan X and a couple of other incubators and tech angel investing funds, the actual figures are likely to be significantly higher. This by the way does not include the recent series E round (US$150 million) raised by Careem in August 2017. I am open to suggestions but my initial reaction was that there would be some contention/skewness on adding these figures to the mix given Careem’s profile and the fact that their series E round was originally announced in 2016. Growth and PE rounds are likely to distort the picture further so it may be better to just exclude them from the list for now. Some transactions can be classified as grants. Most are venture or angel investing rounds. Information summary is based on conversations with three incubators and three venture capital funds who have been active in the local market over the last two years. Transactions only includes rounds successfully concluded and closed in calendar year 2017 as per our original query to our network of friends and colleagues. If you would like to add your transaction/information in the summary please send me a short snapshot on jawwad at the rate financetrainingcourse dot com. Please indicate if you would like to include the figures within the public disclosure section or within private – undisclosed section in the aggregated format. Also indicate if you were incubated or are part of an incubation or investment network. More than the dollar amounts raised the number of transactions and the distribution of transactions across incubation, acceleration and investor platforms is the really interesting result here. The private and undisclosed transactions based figure is most likely understated. Informal feedback and reactions from the tech community indicates that the figure may be 3 to 4 times higher than reported here. Sources and clusters of capital. 8-10 clusters of capital. In addition to private transactions and investors who remain un-named there are 8 primary clusters for raising capital for technology entrepreneurs in Pakistan. The first five are Planet N, Lahore based LCE-NIC, Dot Zero Ventures and The Nestio incubator in Karachi and i2i in Islamabad. Together the five platforms accounted for 39 of the 70+ transactions. The smallest of the 5 raised half a million dollars for their businesses. So the incubation and acceleration platforms are working – both in terms of attracting talent and startups and raising funding for them. They serve as great showcases of the ecosystem and traction achieved by startups for potential investors and partners. If you are working in the financial inclusion space, you have to get an introduction with or to Karandaaz and we suspect in 2018 to Telenor Bank and HBL – which are both likely to come into the venture funding space in a big way in 2018. The newest kids on the block in venture funding are Rabeel Warriach from Sarmyacar and GaditTech. The two new funds are quickly building a reputation for being founder friendly. If you need additional support for product development, commercialization of research or a longer runway for localization or implementation of your product in national markets you should also talk to IGNITE. The fund did 33 transactions in 2016-17 and will most likely do another 15+ in 2018. To date they have funded US$5.8 of projects in the last 12 months and will do another $3 million in 2018. A number of family offices are also actively sourcing deals and doing discreet low profile investing rounds. Wamda, Wadi and Bakery (from Abraaj) are also talking to prospective candidates but haven’t closed a deal as yet or haven’t disclosed their deals. There is also a great deal of grant funding available for directed intervention programs in health, education and digital inclusion segments from grant organizations. This may take a hit in 2018 but one never knows. Takeaway one is that ample capital is available. You may not like the terms or the valuation but it is out there if you want it or need it. Going through one of the clusters makes the introduction easier. Closing the transaction or raising a follow on round though may be a different story. Deal flow. 350 potential deal worthy candidates. Between these 74 transactions (above) and the estimated 80 reported in prior years between 2013-16, we have 150 funded startups who would be looking for funding in 2018. These 150 have gone through one or more rounds of funding, market validation, mentoring and pitching cycles. Adjusting for attrition and failures let’s assume about 100 of these companies survive. The ones who are still left standing in 2018 would be worthy of a closer look because they would have moved forward with traction, market share and revenues. In addition to these 100, crude estimates suggest that as an economy we generate 250-300 startups every year that have the credentials to pitch and the potential to raise funding. The estimate is based on anecdotal evidence and if you work in academia or research a published paper on this topic with actual cite-able data and references would be a great help/service. Investing teams can therefore take their pick from these 300-400 candidates. So there shouldn’t be a shortage of deal flow, as long as you know where to look. Projected fund raising estimates for 2018. US$ 54 million. 120 transactions. The 10xC US$10,000 and the twenty transactions they have done in 2016-17 would skew the size of an average round. Ignoring them for a second gives us an average ticket size of US$ 365,000 per round. We know it sounds a bit off but we have seen a mix of sizes in 2017 ranging all the way from US$ 1 million plus to US$ 80,000 on the lower end. There will be some round inflation given the amount of capital available chasing limited amount of investment worthy deals as well as the fact a number of survivors would have moved from pre-seed and seed to series A or series B. The expectation therefore is that the average round raised in 2018 will be slightly higher. Let’s be conservative and assume that the average figure for a raise in 2018 is US$ 450,000. Let’s also assume that 120 startups out of the deal worthy pool of 400 are able to raise a round. Roughly a 30% success rate for fund raising. That brings us to our projection for 2018. 120 transaction and US$ 54 million in funding. One natural question that follows – Is this much capital available to invest in the local ecosystem? The surprising answer is yes. In addition to local investors we know that a number of regional funds are actively looking to invest. Three new funds are also in the process of raising capital. The total mix of investors looking to invest locally within the technology ecosystem is changing and on the rise. And this despite all the great publicity and media coverage we have received at the beginning of this year. Deal distribution across segments. The most common and popular segments that were able to raise funding in terms of number of transactions and not dollar volume. Healthcare, Logistics and supply chain, Retail, Technology products and Finance. Other segments include Building materials, AI, Data Science, Advertising, Auto, Agri-sciences and IoT. There are a number of spill over deals that did not close in 2017 and are expected to close in Q1-2 2018. They will be a good indicator of how likely or how off these estimates are. In the mean time, please remember feedback is a gift and sharing data, makes it possible for all of us to step forward together. How to read the table above. Because a number of transactions are still private they have been aggregated using their common theme. This could be incubator (Nestio, LCE, DZV,10xC), Investors (Vostock, Sarmyacar, FDV) or business (Finja, Procheck, Augmentcare). Figures are backed by news sources, press releases or conversations with related parties. Figures quoted by related parties have been taken at face value without any additional due diligence or fact checks. Some reported numbers have been adjusted to reflect the distribution of deals in 2017. A big thank you to all the friends, colleagues and well wishers who helped out with the data collection. Quite a few requested to remain anonymous and behind the scenes. Special thanks to Jehan Ara at the Nestio, Yusuf Jan at DZV, KZ at 47 Ventures, Yusuf Hussain and Ali at IGNITE, Saif Akhar at Planet N and 10xC, Nash at Integry, Asad Memon at StartupList.pk, Anusheh Naveed Ashraf at i2i, Faizan Siddiqi at Interlink Multimedia and Amna Mashal for your assistance and guidance in collecting these figures. And a big hand to those who helped by preferred to stayed anonymous. Disclaimer – The numbers are by no means complete or final. This is just the beginning of an attempt to start a conversation on the topic that would allow us to get more data and get closer to a final more accurate estimate. Help us get better and closer to the actual figure by sharing your data. Also check out the Business case for Pakistan and the Pakistan Middle Class size estimation challenge. Updated: 8th Jan 2018. Updated Nestio figures received and incorporated in the summary. Updated: 4:48 pm, 9th Jan 2018. Updated Planet N, 10xC and a number of other individual transactions. Added analysis and insights section. Updated: 4:51 pm, 10th Jan 2018. Updated i2i EcoEnergy raise, added TL;DR; Venture funding summary 2017 and venture funding projection for 2018 image. Updated main table. Final update: 8:55 am, 11th Jan 2018. Updated Planet N, 10xC 2016-2017 breakup, i2i commentary, added section on IGNITE updated private funding, added Techlets, updated main table and summary graphic. Next Next post: The Sentient Machine – A treatise on the debate around AI.